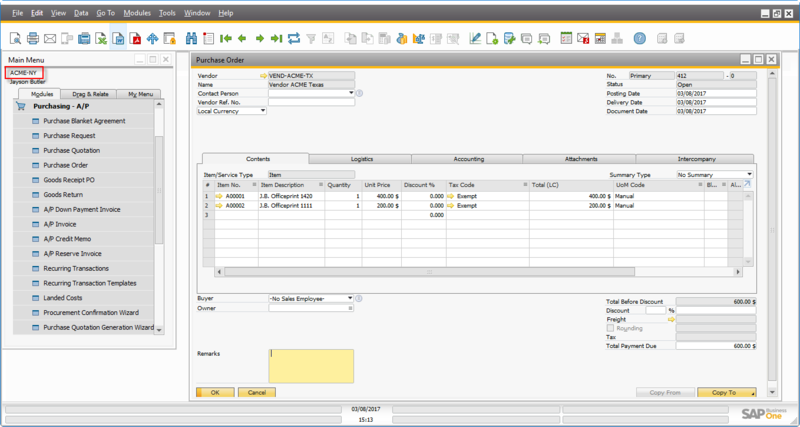 The Intercompany Integration Solution for SAP Business One enables businesses running SAP Business One to manage intercompany transactions for multiple companies by automatically replicating corresponding transactions between the company databases. Consider a sales subsidiary that buys finished goods from a manufacturing plant. 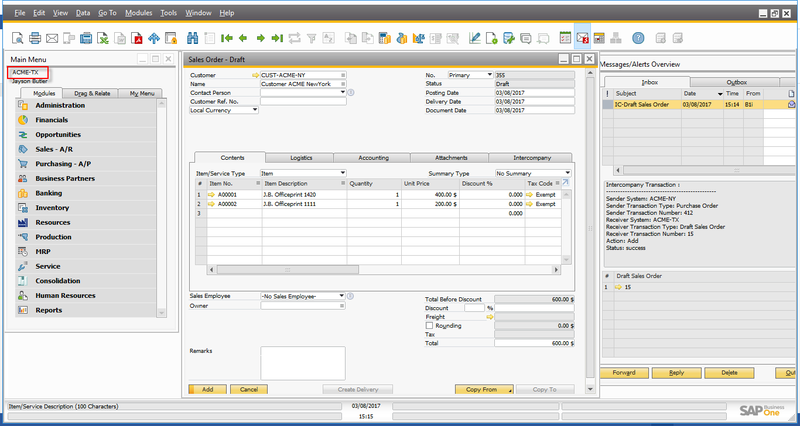 When the sales subsidiary creates a Purchase Order in its SAP Business One application, the solution automatically triggers the creation of a sales order transaction in the SAP Business One application of the manufacturing plant. 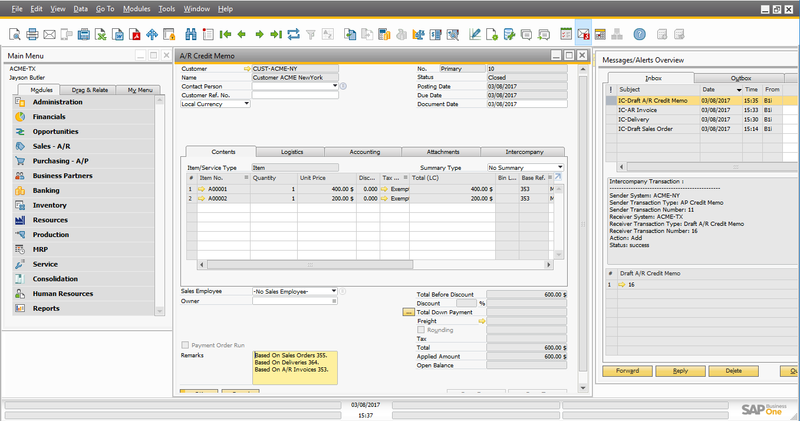 The ability to automatically create a related (reciprocal) transaction in the other application eliminates manual data entry, improves employee productivity, and reduces the potential for errors from rekeying data. 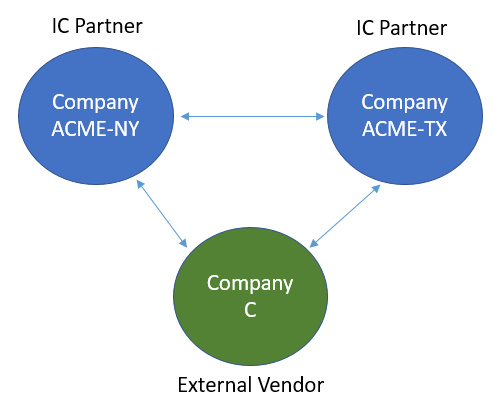 In the intercompany trade, each branch company can buy and sell from other branch companies, but you need to create business partners of type Vendor and Customer to represent each branch company. Since these business partners exchange marketing documents, you need to mark each as a branch company. 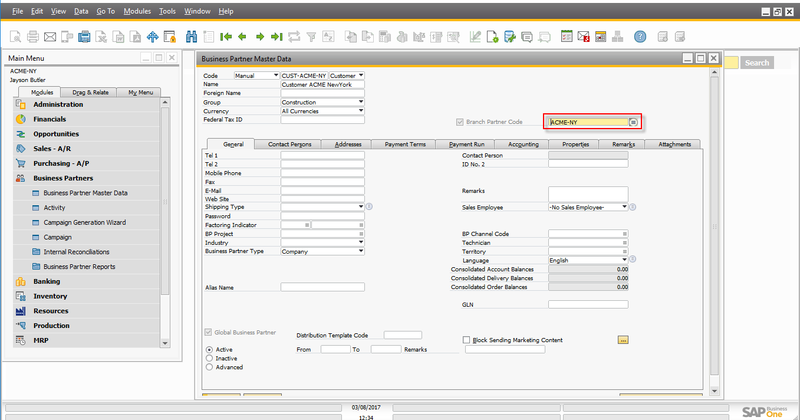 Additionally, since a combination of a vendor and a customer represents each branch company, you must identify this pair of business partners with a common, unique code, for example, the value that you enter in the Branch Code field when you create the business partner. 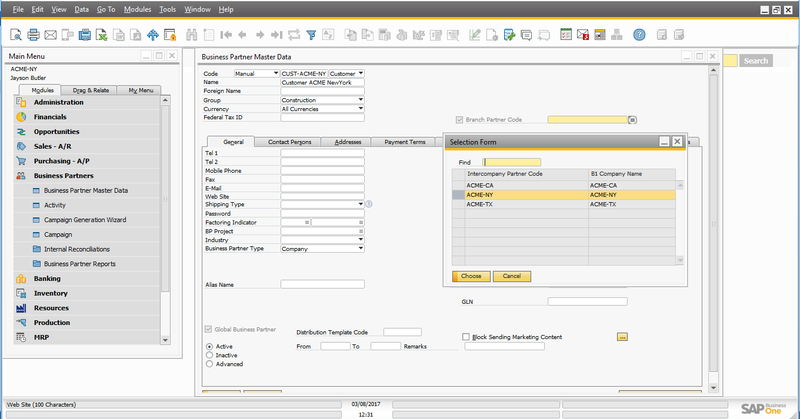 From the SAP Business One Main Menu, choose Business Partners -> Business Partner Master Data. 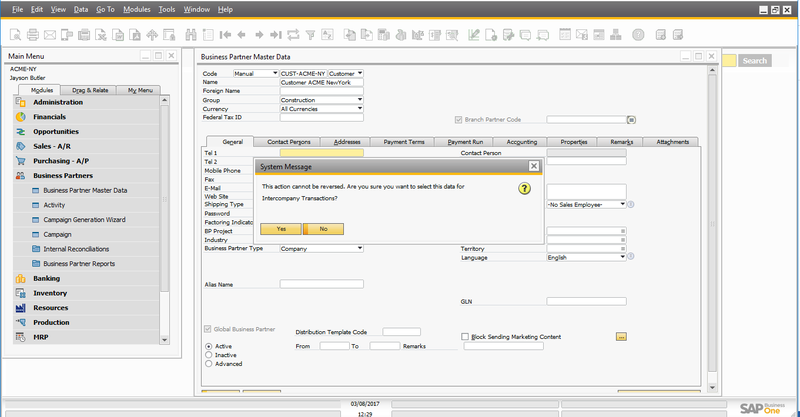 The Business Partner Master Data window appears. To switch to Add mode, choose Add. Specify the Business Partner Code. Let’s specify the code as “CUST-ACME-NY“ for the customer representing Acme New York. 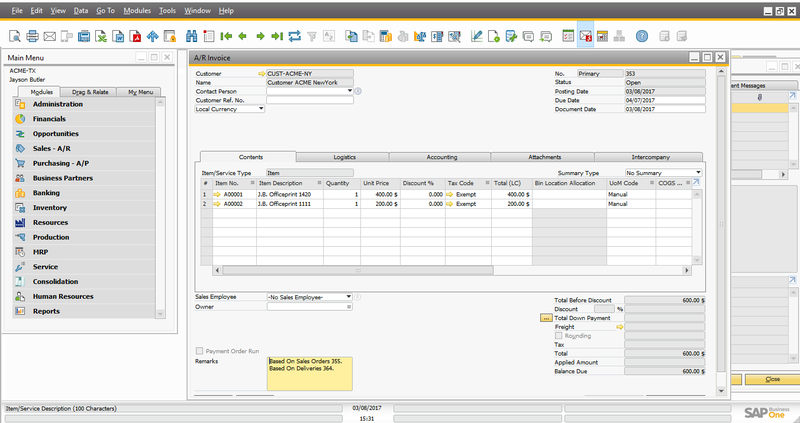 Select the type of the business partner, for example, Vendor or Customer. Let’s select Customer. Choose a currency as All Currency. 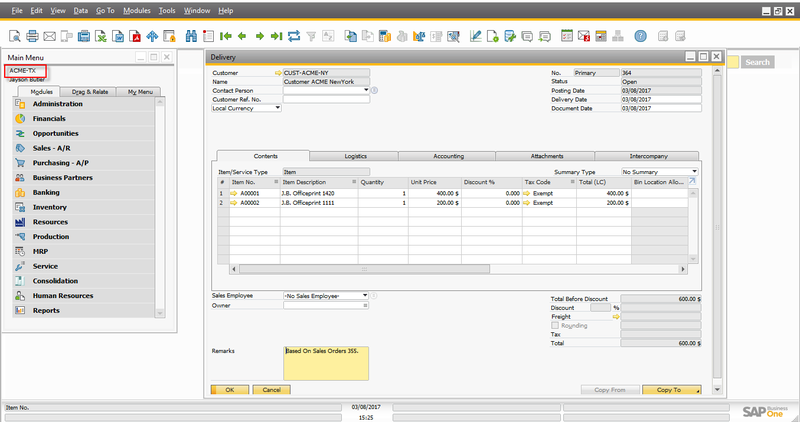 Select the Branch Partner Code checkbox. In the confirmation message, select yes. In the Branch Partner Code field press TAB. 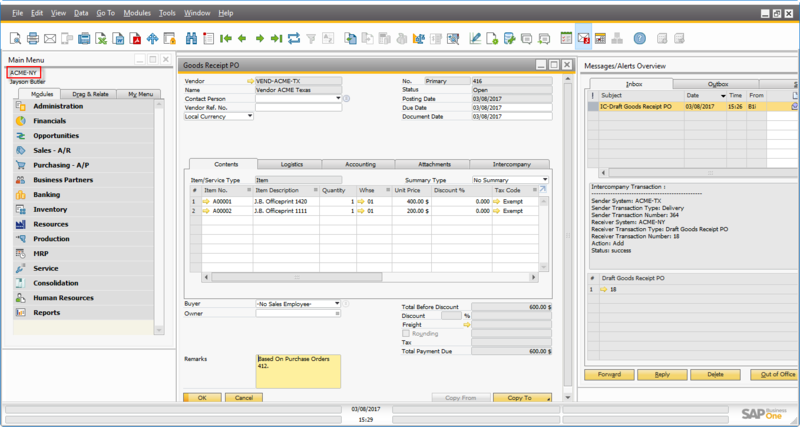 The system displays a list of branch codes that were defined during the landscape setup for the Intercompany Integration Solution. 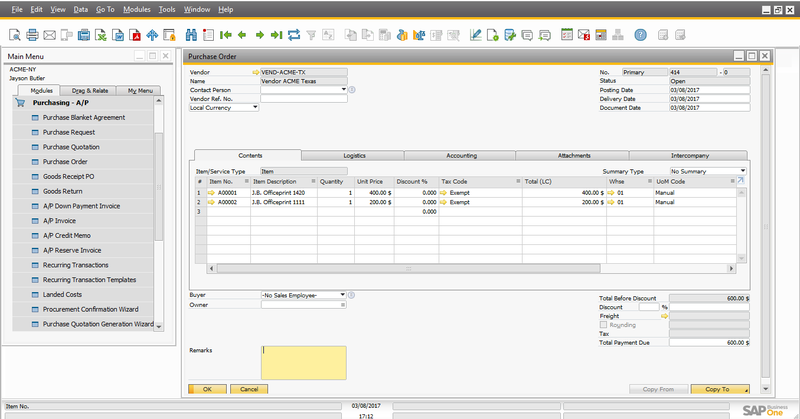 Select the appropriate Intercompany Partner Code from the Choose from List window. Let’s select “ACME-NY” to represent the Acme New York customer. The system enters the code in the Branch Partner Code field. Specify all other relevant information and choose Add. The business partner is created and replicated to all other branch companies. 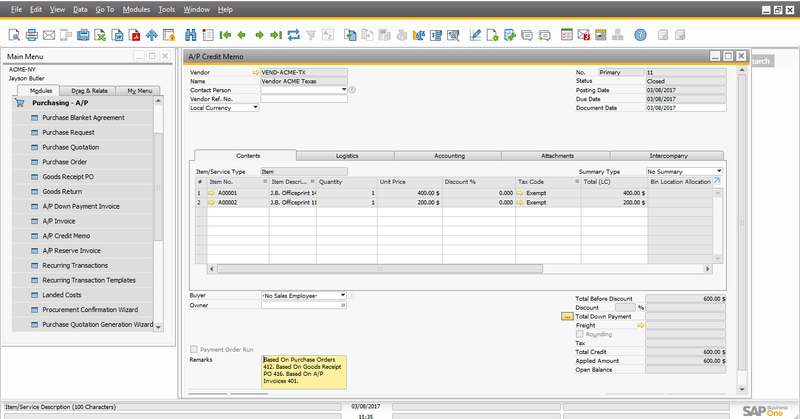 Similarly, you can create other customers and vendor that represents branch companies. As a best practice, we recommend that you create all branch company type business partners (those that represent all branch companies) in one of the branch companies, for example, the head office, as these will be replicated to all other branch companies. Company ACME-NY raises a purchase order on Company ACME-TX. A draft sales order is created in Company ACME-TX. 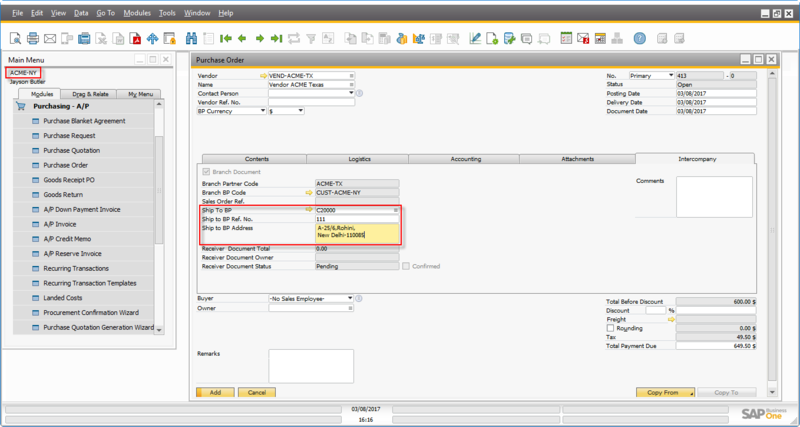 A user in Company ACME-TX changes the document status to ‘Accept’ from the Intercompany tab as shown below and convert the draft document to a firm document. 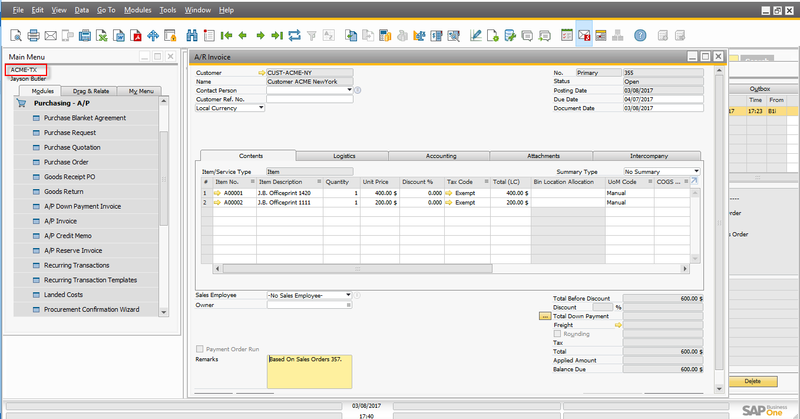 A user in Company ACME-TX creates a Delivery against the Sales Order added in step 3 as shown below. 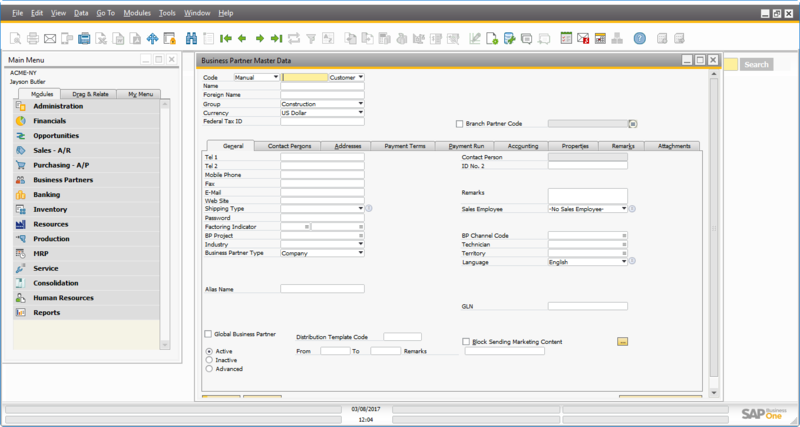 A user in Company ACME-NY changes the document status to ‘Accept’ from the Intercompany tab and converts the draft Goods Receipt PO to a firm document. Company ACME-TX raises an A/R invoice with reference to the Delivery (added to the system in step 4). 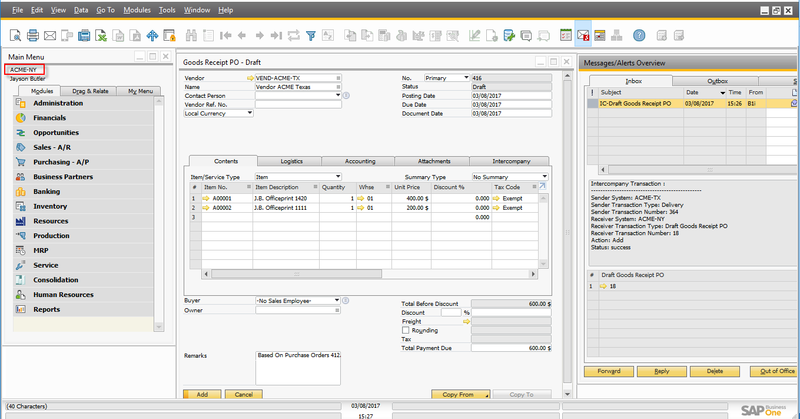 A draft A/P invoice is created in Company ACME-NY. Company ACME-NY raises a Goods Return with reference to the Goods Receipt PO (added to the system in Step 6). A draft Return is created in Company ACME-TX. Company ACME-NY raises an A/P credit memo with reference to the A/P invoice (added to the system in Step 9). A draft A/R credit memo is created in Company ACME-TX. 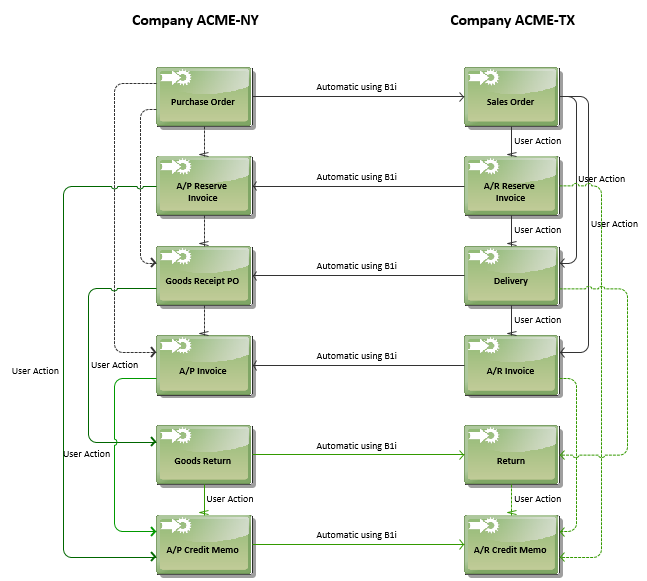 A user in Company ACME-TX converts the draft A/R Credit Memo to a firm document. 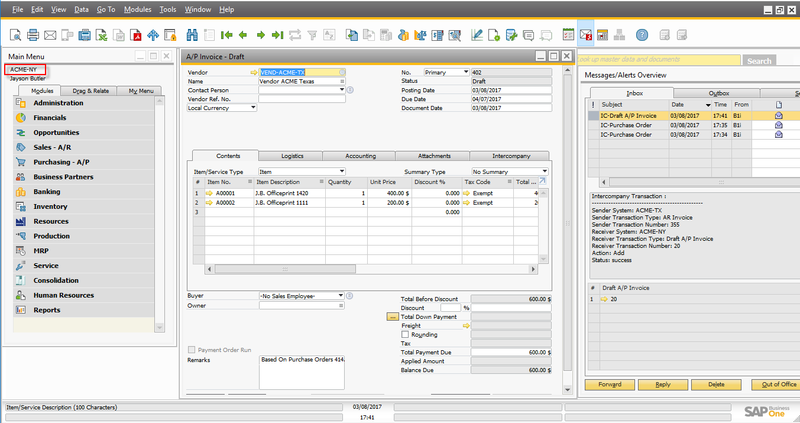 Intercompany Solution supports the interbranch purchase/sales transaction to an external customer. 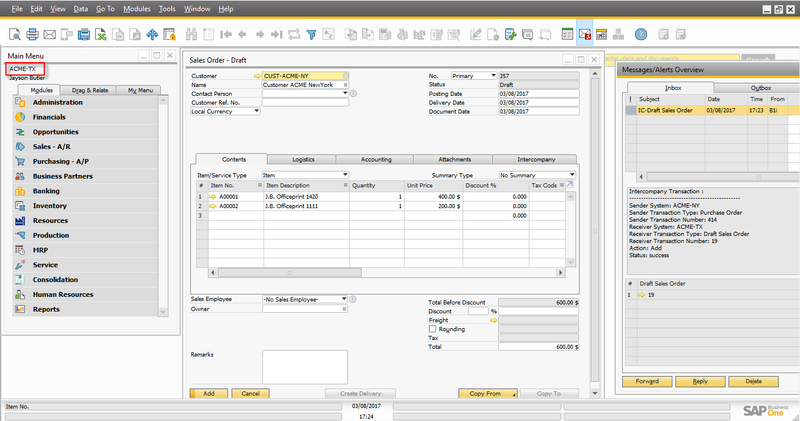 It is possible that a Branch Company receives the sales order from an external customer, but may not have the inventory to fulfill the order. In such a case, another branch can fulfill the order with their inventory and deliver ordered goods directly to the end customer. An external customer, let’s say Company C raises a Purchase Order on Company ACME-NY. 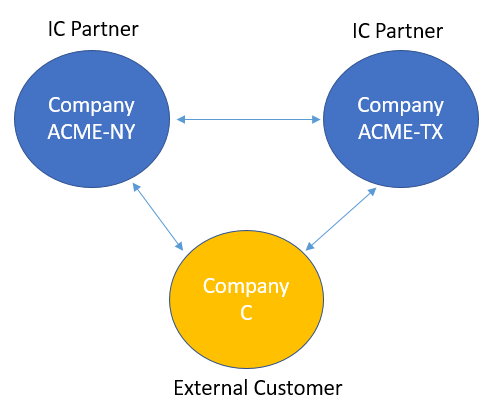 Company ACME-NY creates a purchase order (raised on Company ACME-TX) against the sales order created in Step 2. In the Ship To BP field of the Intercompany tab of the Purchase Order, choose the Customer of Company C.
User in Company ACME-TX converts the draft document to a firm document. 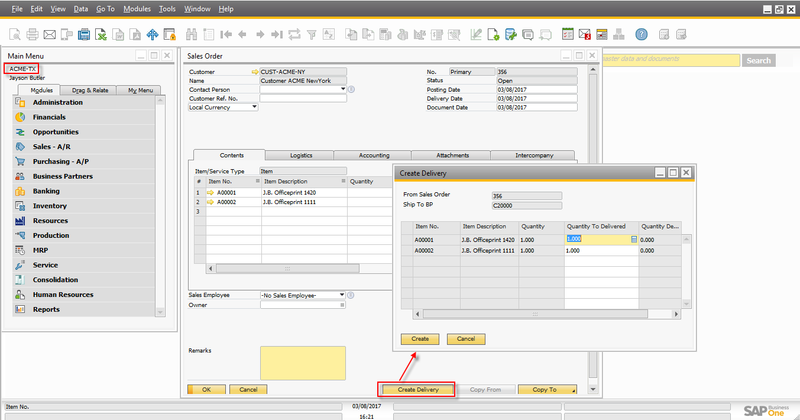 User in Company ACME-TX creates a delivery document for Company C (from the sales order) by clicking the create delivery button. 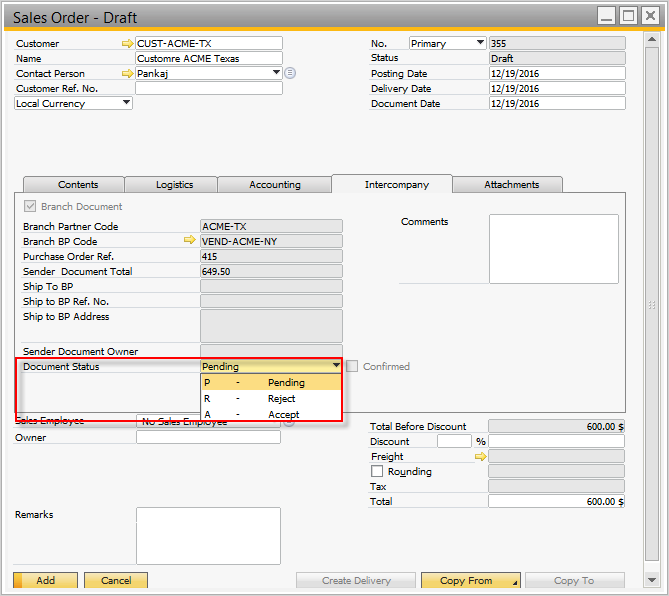 A draft delivery document is created from the sales order (for the Ship to BP) by choosing a Create Delivery button on the Sales Order window. 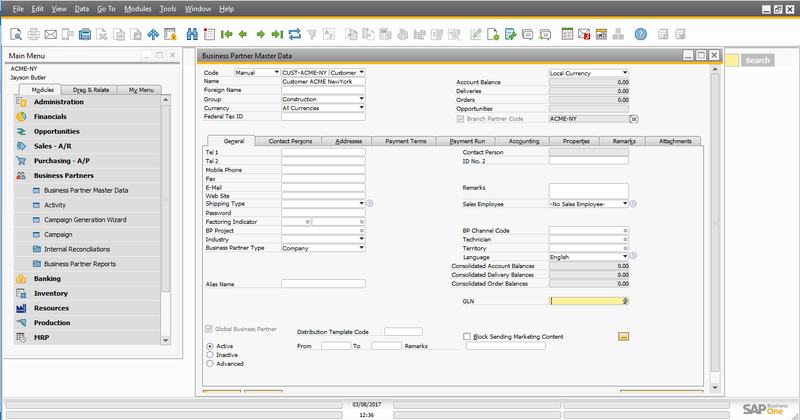 The delivery document is closed automatically, immediately after a user adds it to the system. Company ACME-TX converts the draft document to a firm document. 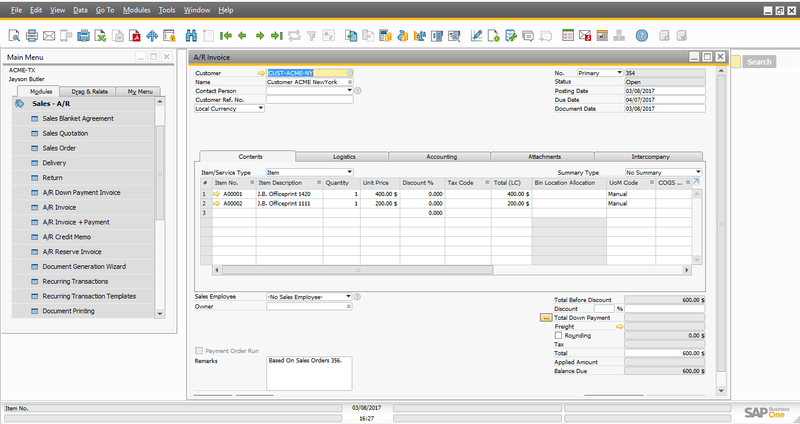 Intercompany Solution supports the interbranch purchase/sales transaction to an external vendor. 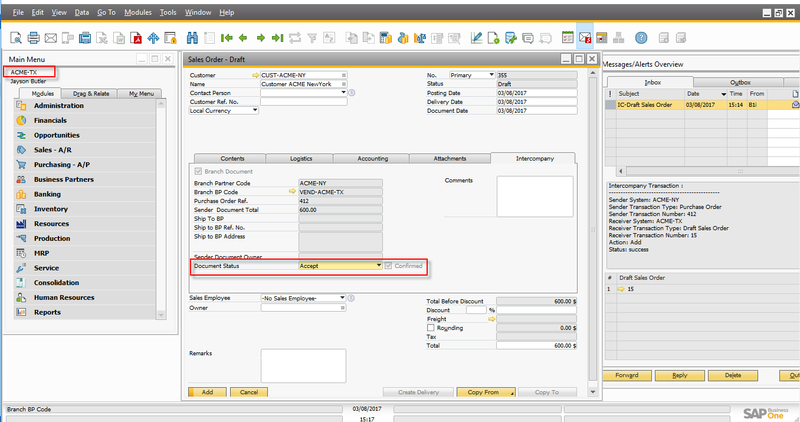 It may be possible that a Branch Company receives a sales order from another participating branch company, but the Branch may not have inventory to fulfill the order. 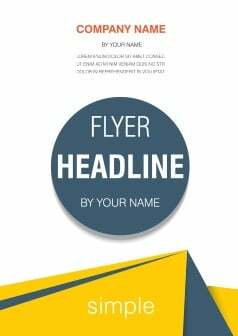 This branch company can raise a purchase order to an external vendor with the instructions to delivers the goods directly to the branch company requesting the goods. Company ACME-TX changes the warehouse on the document lines to a drop ship warehouse and marks the sales order as a drop ship type and converts the draft document to a firm document. Company ACME-TX creates a purchase order (raised on Company C) against the sales order created in Step 3. Company ACME-NY creates a goods receipt PO against the delivery of Company C.
Company ACME-NY closes the goods receipt PO created for Company C.
Company C notifies Company ACME-TX regarding the delivery of goods to Company ACME-NY. Company ACME-TX raises an A/R invoice with reference to the sales order (added to the system in step 3). 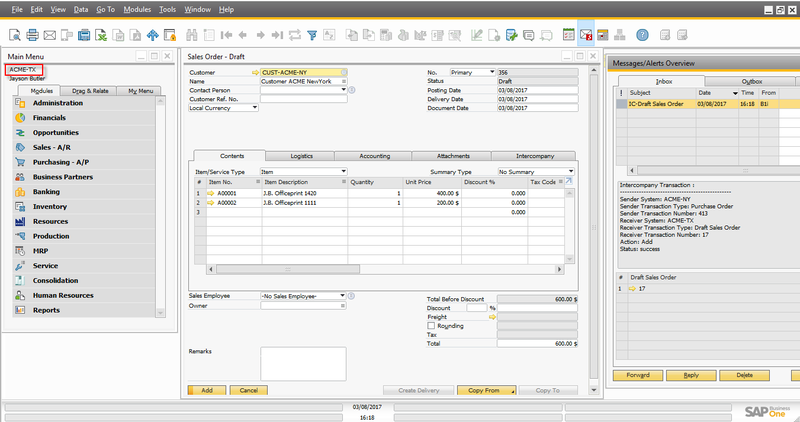 The system creates a draft A/P Invoice in Company ACME-NY. User in Company ACME-NY converts the draft document to a firm document. 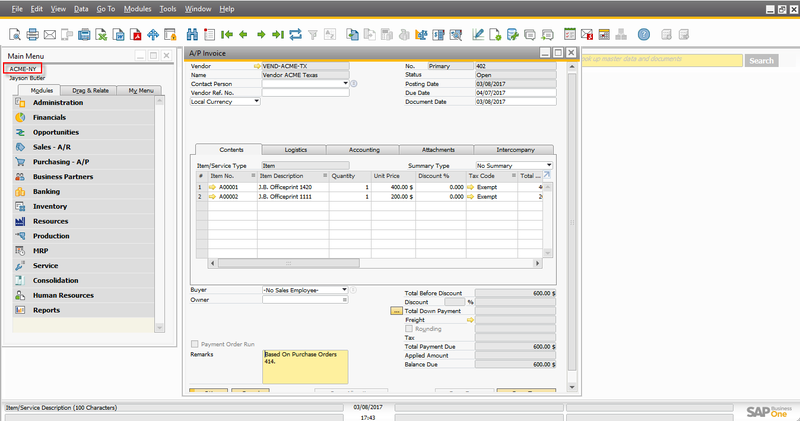 In SAP Business One 9.2, you can cancel sales and purchasing documents that would normally trigger postings. When you cancel such a document, a corresponding cancellation document is created to reverse the associated accounting, tax, and inventory changes. The base documents of the canceled documents are reopened with balances due restored. In the Intercompany Document Exchange Cycle, when a user cancels a document, the application automatically cancels the reciprocal document. Company ACME-NY creates an A/R Invoice document to Company ACME-TX. 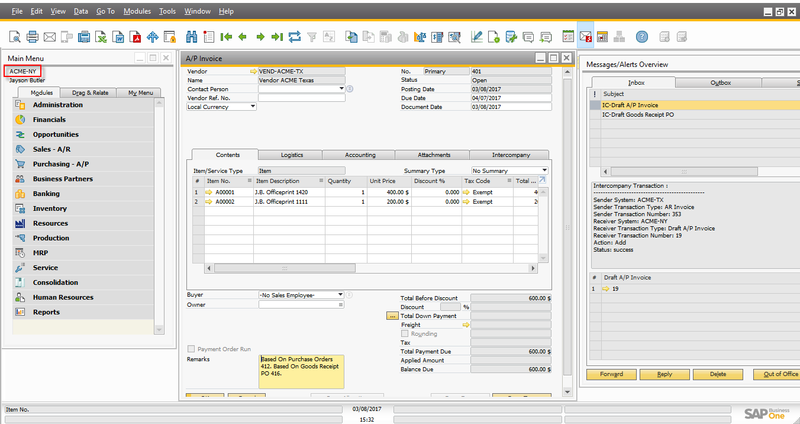 The A/R Invoice document creates a draft A/P Invoice in Company ACME-TX. 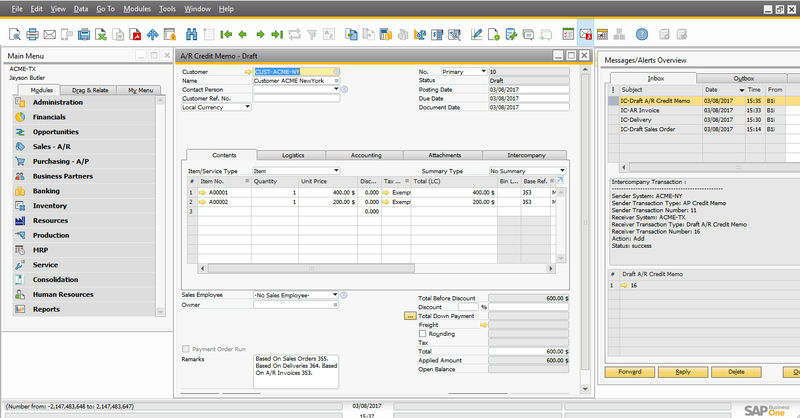 If a user in ACME-TX rejects the draft A/P Invoice, then Solution closes the draft and creates the A/R Invoice cancellation document in the sender company ACME-NY. 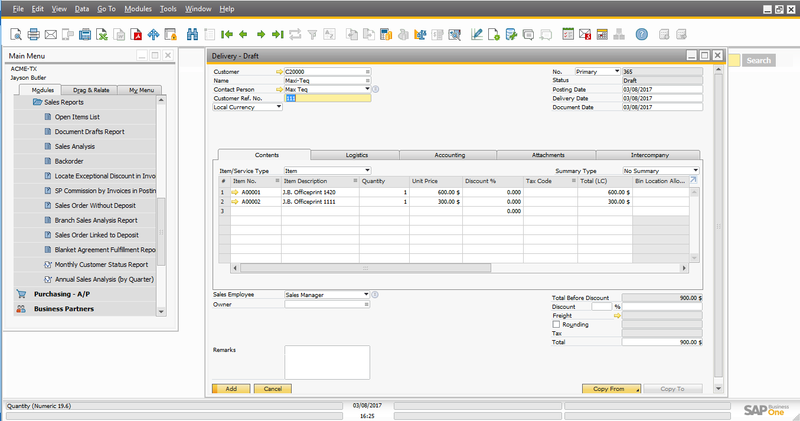 The Workflow in Intercompany Trade feature enables the branch companies to accept or reject the incoming draft documents, and notify the sender company of their decision.